Disclosure: Thanks to Unicoi and US Family Guide for providing us with this coupon code for our readers. All opinions are our own. We may have been compensated for our time sharing this with you with payment or goods. ChiIL out with ChiIL Mama and our friends over at Unicoi Art Studio. Why should the kids have all the fun. You're never too old or too busy to get creative! We've partnered up with Unicoi for kids' art projects at our weekly kindie family music series at The Beat Kitchen and summer festivals, but did you know Unicoi offers classes and special events for big kids (AKA: grownups) too?! Come check out Unicoi Art Studio's Paint the Town Bar Tour! Enjoy a two hour painting class, drinks and food specials at your favorite local watering holes. It's time to paint this town red! Click here for dates and more info. 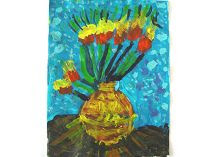 Unicoi Art Studio has been providing exceptional art activities for kids since 1999. 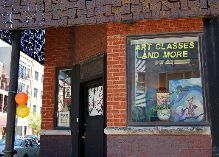 We were voted the best art classes in the city for 2008 and 2009, by the parents of Chicago (Nickelodeon's Parents Picks Award). Unicoi’s mission is to “draw” out the imagination in every child, with projects designed to be informative, engaging and fun for children ages 3-15. We use premium quality artist materials, so at a young age the students experience rich colors, unusual textures and a variety of unique materials. Our teaching philosophy is for children to be able to use their creativity to explore the subjects that interest them and for our teachers to provide the safe and structured environment to support their exploration. We deeply value our roles as art educators and these values are expressed by our passion towards both children and art. Unicoi is also excited to be able to bring to you adult classes. Whether you are a beginning artist or have been painting for years and just want a fun atmosphere for inspiration, we have several class options to choose from. Learn the basics in drawing, painting or come to an open studio day to create on your own masterpiece. You can find more information on Unicoi Art Studio and class schedule on their website or follow on Facebook or Twitter. Also make sure to take advantage of this exclusive coupon for 15% off your first class!